For some time, we have been on the lookout for a good male to bring to our farm as an outcross, but it was a difficult step to take because we also wanted to stay with the old bloodlines that have served us so well. 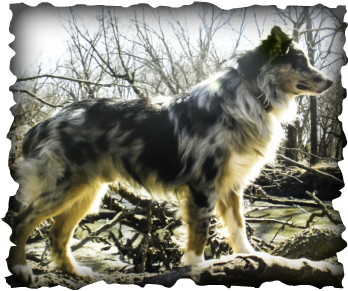 Certik-Bertik kept catching our eye because he kept those Hangin' Tree bloodlines close to the forefront, and he is just one incredible dog. (I mean how can you not love saying "He is the most titled Aussie in the world?") Certik really exemplified everything we loved about the old working lines from his keen stock sense to his stick-to-it work ethic to his devotion for his family. When a male pup was available from him, we had to jump at the chance and so Hans joined our family. After Rose Marie's knee replacement, the older more experienced dogs seemed a safer bet when working the cows until she could hobble a little faster if things went south so Hans hasn't gotten any time in with the larger stock. However, he has helped with the sheep and goats during feeding time or when someone (ahem.. Angela) forgot to latch the gate. 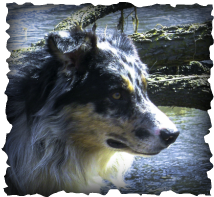 He works with a lot of eye and intensity compared to most Aussies -- an intensity that is probably most similar to Char among dogs that we have previously worked. Hans is a very silent worker and only barks or bites with purpose. While this degree of presence and self-confidence often develops with time and experience, it is really impressive for a dog with limited time on stock. Hans moved to Iowa with Angela late 2015 to get more diverse experiences, and (hopefully) see if they can enter some competitions together. He has adjusted to being a housedog remarkably well (although he was less than impressed to go from a 50 - 70 degree Arkansas winter to a 0 - 15 degree Iowa winter.) Angela is hopeful that they can learn enough to get their feet wet in a few more trials this year. We will keep you posted on the progress. Hans tested Normal/Normal. i.e. not a carrier, for the following mutations MDR1 (Ivermectin Sensitivity), Collie Eye Anomaly, Cone Degeneration, Canine Multifocal Retinopathy 1, Degenerative Myelopathy, HSF-4 Hereditary Cataracts, Hyperuricosuria, Neuronal ceroid lipofuscinosis 6, and Progressive rod-cone degeneration.